Fifteen years ago an IT professional experienced a drastically different day-to-day on the job. While the main mission has always remained constant, to take charge of all internal infrastructure, but the infrastructure itself has moved off-premises over time. The complexity rested in networking for IT professionals. Routers, switches, firewalls, and other gear needed to be managed so the network would function. Employee devices also required attention from IT admins, but these devices were typically all Microsoft Windows machines. This allowed IT to standardize their tools and platform. Time has drastically altered the lives of IT admins and, after fifteen years of evolution, organizations have moved away from large, ungainly on-premises networks and data centers. However, the list of endpoints for infrastructure has grown rather complex, specifically as a result of the implementation of different platforms and operating systems. The challenges faced daily and the knowledge needed to be successful has exponentially grown. 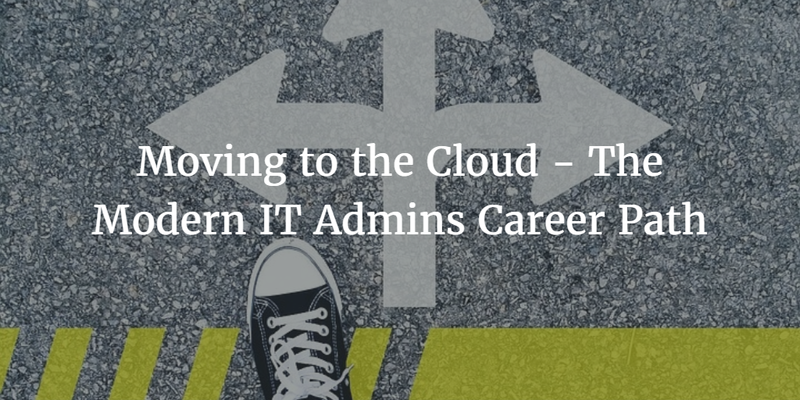 Below we will take a deeper look at three of the larger changes that IT professionals must ponder as they elevate their careers in the burgeoning cloud environment. The time when it was important to know how to configure a router or switch is slipping away. In the modern IT world, this task has been adopted by cloud infrastructure providers like AWS and Google Compute Engine, as well as the telecommunications companies that deliver your internet connection. The job for IT admins has leveled up, as now it is vital to know how to manage and configure the higher levels of infrastructure. The ability to route traffic through security groups and automate the configuration of systems is a necessity. Writing code to automate these tools is now the norm for an IT admin. In the past, IT could dictate the tools that employees had to use, but this ship has sailed. Employees have begun to adopt their own tools to further maximize their efficiency, which forces IT to adapt and get ahead of the game. It is crucial to show employees both flexibility and confidence when leveraging new technologies. As a result, employees will work with you and not go out and create Shadow IT projects. Seeking out and securing cross-platform tools that allow you to manage the various endpoints and services your team is leveraging is of the utmost importance. These tools do exist, however, they typically are not offered by traditional vendors such as Microsoft, HP, and Oracle. Not long ago, security for IT admins was simply firewalls and anti-virus solutions. Fifteen years later the world of IT security is far more intricate. To be successful in the IT world, an admin needs to be an expert at infosec so they can understand and defend against the massive world of cybercriminals. Identity theft is rampant and hackers are always trying to locate vulnerable systems that have not been patched. It is because of this that IT admins need to be constantly on their toes and protecting their organization. Without IT, business simply wouldn’t get done. Sales would not be able to email contracts, products would go undelivered, customers would go unbilled, and other core activities would fail. The IT admin is a vital part of every organization, which is why they are in high demand today. Mastering new technologies and understanding the constantly evolving approaches to IT can be the difference between an organization falling flat on its face or leading an industry. To learn more about how JumpCloud’s Directory-as-a-ServiceⓇ can help wrestle the wild world of IT into submission, drop us a note. If you are interesting in rolling up your sleeves and trying our product out first give the free trial a run – the first ten users are free forever.